Causal loop diagrams (CLDs) are a very simple but powerful way of visualizing important parts of the system and how they interrelate. It is a great tool for dealing with complex problems and the striking component of system dynamics. • Communicating the important feedbacks you believe are responsible for a problem. They show the interrelation between causes and their effects. As stated above there are other tools which are used for modelling of system dynamics. One of them which could seem the same as the causal loop diagram is a Fishbone diagram (or we can call it a "Cause and effect diagram"). But the fishbone diagram is different because it can induce categories of causes that impact a problem. Although CLDs focus on causation too, there are differences because CLDs are more general and more expressive than fishbone diagrams (Osgood, 2004). There is diagram of the negative and positive reinforcements after finishing a CLD. The main principle of the Causal loop diagram is quite simple. Parts of a system are visualized using textual identification. The connections between the parts are shown using arrows pointing in the direction of influence. Creating the causal loop diagram with given system is actually quite simple. We start with the parts we already know and keep asking what influences this part has until we reach parts that are at the systems boundary. There are all parts that do not change. Then you go in the other direction and keep asking which other parts of the system influence this part If that part is already there you connect it otherwise you create a new part. CLD consists of nodes which represent variables and arrows which represent relationship between variables. There will be explained main symbols of causal loops and procedure of their creation. If we want to put system in practice, we have to follow some rules. 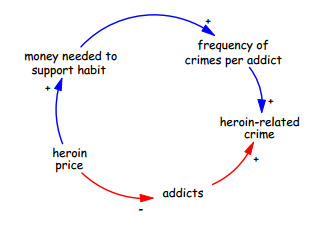 There are several causal loop concepts (Haraldsson, 2000). The arrow is used to show causation. The item at the tail of the arrow influences the item at the head of the arrow. The + sign near the arrowhead signifies that an increase (or decrease) in the first variable leads to an increase (decrease) in the following variable. The – sign near the arrowhead signifies that an increase (decreases) in hte first variable leads to an decrease(increase) in the following variable. The symbol B, which is in the middle of a loop, signifies that the loop moves away from equilibrium point. This loop continues going in the same direction. This loop called a positive feedback loop. The symbol R, which is in the middle of a loop, signifies changing direction of the loop. It means that the system moves toward equilibrium. This loop called a negative feedback loop. Two hash marks on the causal loop represent a delay. It is a situation to take time before the effect occurs. You can see all these symbols and hash marks in the picture describing population. In this diagram we can see that two things which change population are death and birth. More births cause the population to increase and more deaths lead to the decrease in population. Because systems are always running circular in organizations, they form feedback loops. We should state, what the word feedback loop means exactly. In many cases changing one factor will impact another factor (there is some effect). This factor will again effect the first one (there is some cause). Because of this it is called the feedback loop. There are two main types of feedback loops which are called positive and negative feedback loops. All loops will be explained with an example and there will be stated their dynamic behavior in the next chapter. This loop is called a reinforcing or amplifying loop and leads to growth at an ever-increasing rate. This type of growth is called as exponential growth. 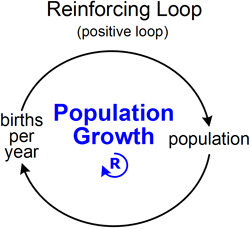 The reinforcing loop is typical for population growth. When population goes up, births go up. As we can see in the picture a loop goes always round until there is a hit limit (but this is not usually shown). Another example of the positive feedback loop is a theatre trying to improve its profitability. If the theatre gives more investments in its production there could be better plays and more famous actors. If there will be famous actors, more people start to visit the theatre and there will be higher ticket sales (Mind Tools Ltd, 2014) (Harich, and other, 2014). Positive feedback loop - Example of Population growth (Harich, and other, 2014)"
This loop is called a balancing or goal-seeking loop because it looks for a goal. It means if the actual state of the variable doesn’t reach the goal the loop structure pushes its value up. On the other side if the variable is above goal, it pushes it down. An example of this loop is a thermostat which you can see in the picture below. The principle of the thermostat is that if the temperature in the room is higher (or lower) than the set temperature, the thermostat increases (or decreases) the actual temperature. Another example is situation of under-resourced service company which wants to raise quality. Although better quality of services directs to improved customer satisfaction (and leads to an increase in demand), the company has not too much time for customers and this influences its ability to improve quality. So the number of customers again decreases. (Mind Tools Ltd, 2014) (Harich, and other, 2014). 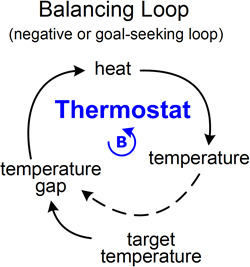 Negative feedback loop – Example of Thermostat (Harich, and other, 2014)"
Other special cases of loops are negative feedback loops with delay and combination of positive and negative loops. Dynamic behaviour of negative feedback loops with delay can direct to oscillation. The amplitude of Oscillation can last indefinitely, or in other cases oscillation could gradually decrease. The amplitude of the oscillation decreases if the variable moves towards the goal. An example of the gradually decreasing amplitude of oscillation is distribution systems (Kirkwood, 2013).This situation with a delay we can´t usually anticipate, because we don´t now how long the period takes. The very good example is taking a shower. After turning on a faucet the water is coldfor several seconds.. So we turn the faucet wide open, but when hot water comes out it is too hot. We have to turn it off again and so on until we get the comfortable shower with an optimal temperature. Simulation of this process is illustrated below (Haraldsson, 2000). Positive and negative feedback loops usually don’t work distinctly. They can be combined. The dynamic behavior in combination of positive and negative loops towards to different patterns. (Kirkwood, 2013). This is typical for biochemical switches. They have to work together because they have to make special flexible system. At first it can lead to positive feedback loops and towards to exponential growth. In next step it is difference. This part is derived from (Kirkwood, 2013) and (American Creativity Association, 2014). There is no integrated process for drawing a causal loop diagram. But some recommendation can be made. 1)	At first we have to start with the problem. We have to understand and define the problem which shall be solved. This is necessary to start with. We should ask what is wrong and what the root source of the problem is. When we want to find a cause ask why, to find effect ask what happens. When we are thinking about elements of the causal loop diagram we should use nouns and noun phrases. We should use e.g. 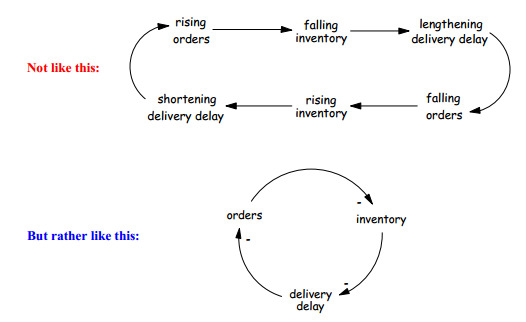 only orders, inventory and delivery delay instead of rising orders, falling orders, falling inventory and so on because it is better organized. You can see this example in the picture below. 2)	Describe relations between a cause and effects. Bear in mind constantly that + and – doesn’t mean bad or good. Plus is used for intensification and minus is used for diminishing effects. When we construct links, we should expect that there can be other possible unexpected sides. We should think about adding this links for representing side effects. 3)	When we draw a negative feedback, it is usually comprehensible if there is existing gap which directs toward the goal. 4)	In many examples we can except that there is adelay before the actual state is perceived. For this situation it is important to include the causal loop diagram for the actual value and the perceived value. 5)	In many causal loop diagrams there is no difference between a long and short result or process. And this is not so right, because you should make difference between these two states. 6)	If you think that the links between two elements are hard to say in a simple way, you should use more simple intermediate elements. 7)	For someone who is reading your diagram it is necessary to have it in a simple form. The diagram shouldn´t depict every detail. There are many practices of causal loop diagrams in business or work academy but there are some problems around these diagrams too. We talk about both below with some examples. Causal loop diagram of every day tasks (Transentis Consulting, 2014)"
We can ask how the causal loop diagram is useful in practice. If we develop it and present it carefully, it can be very useful for us. We can find very successful CLDs in practice. The most popular example are CLDs of population growth (it could be people or animals or both, that doesn’t matter) and resources diagrams. In the population growth diagram we can control how Immigration and the birth and death rate change over time. There could be a more extensive demographic example with different age groups and other factors (Halbleib, 2014). But there are other examples of great use of CLDs. CLDs can be useful in causal modelling to understand organizations and businesses. This is trend in the recent years. CLDs are used in business prototyping, where we can model productivity and causes which influence it, e.g. remaining time, schedule pressure, deadline and so on. This causal loop diagram can be seen on picture (Transentis Consulting, 2014). Other examples of causal loop diagrams are in medicine, biology or environment. In medicine the causal loop diagram is used to illustrate for example the dynamics of diabetes. The diagram and its detailed description can be seen in (Fonseca i Casas, 2014). There is also a possibility to describe cases and effects of fish pond ecosystem by CLDs. PA Consulting Group created a CLD called “Afghanistan Stability / COIN Dynamics“. It is the extensive diagram summarizing a snapshot of U.S. military´s plan (PA Consulting Group, 2010). In many cases it is clearer to use a hybrid diagram which contains a stock-flow chain. But using it could be harder for visual language. There are also many problems with notation. There is not uniform labelling. Sometimes it is used an “s” (means “same”) and “o” (means “opposite”) instead of the + and -. This problem is explained by George Richardson in his paper “Problems with causal loop diagrams” and his conclusion is that it is not good to use “s” and “o” because it is more confusing. (Richardson, 1986). In this paper there was described the causal loop diagram, its creation and usage in practice. As we could see CLDs are quite popular diagrams in practice and are widely used. We can use them in business but in academic work too. For their user it is easy to start drawing these diagrams because all you need to draw CLDs is pencil and paper or a whiteboard. There are many softwares we can use for drawing this type of diagram too, e.g. Vensimo (for free), STELLA (free, but only for 30 days trial) or AnyLogic (free trial) and other software. As it was said in the chapter "Problems of CLDs", sometimes it can be a problem to make the causal loop diagram because of various notations. But CLDs can be very helpful still. There are two tasks to practice causal loop diagrams. Below there are answers. 1) Try to illustrat a causal loop diagram in the picture dealing with zebras and lions. There is help in the form of predefined words which should be used in the causal loop diagram. 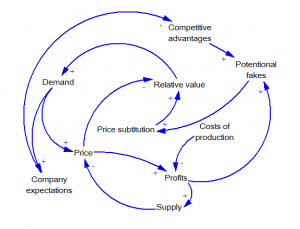 2) Try to draw your own causal loop diagram which contains main variables like demand, supply, profits, price, company expectations, cost of production and other things around this. The example of this causal loop diagram you can see in the answer. Answer for question number 1. Answer for question number 2 - example how this casual loop diagram could look like. • American Creativity Association. 2014. Causal loop diagram. American Creativity Association. [Online] 2014. [Cited: 27 December 2014.] http://www.amcreativityassoc.org/Resources/Documents/CausalLoopDiagrams.pdf. • Fonseca i Casas, Pau. 2014. Formal Language for Computer Simulation:Transdisciplinary Models and Applica\\Ction. Hershey : IGI Global, 2014. 978-1-4666-4370-3. • Halbleib, Harold. 2014. System Models & Simulation. http://www.projectperfect.com.au/. [Online] 7 November 2014. [Cited: 30 December 2014.] http://www.projectperfect.com.au/info_system_models_and_simulation.php. • Haraldsson, Hördur V. 2000. Introduction to Systems and Causal Loop Diagrams. Lunds Universitet. [Online] January 2000. [Cited: 30. December 2014.] http://cmap.crs.org.pl:4444/rid=1244140954250_1167059429_1461/Introduction%20to%20Systems%20and%20Causal%20Loop%20Diagrams.pdf. • Harich, Jack and Bangerter, Philip. 2014. Feedback Loop. http://www.thwink.org/. [Online] 2014. [Cited: 29 December 2014.] http://www.thwink.org/sustain/glossary/FeedbackLoop.htm. • Kirkwood, Craig W. 2013. System behaviour and causal loop diagram. Arizona State University. [Online] 12 January 2013. [Cited: 28 December 2014.] http://www.public.asu.edu/~kirkwood/sysdyn/SDIntro/ch-1.pdf. • Mind Tools Ltd. 2014. Systems Diagrams - Understanding How Factors Affect One Another. http://www.mindtools.com/. [Online] 2014. [Cited: 29 December 2014.] http://www.mindtools.com/pages/article/newTMC_04.htm. • Osgood, Nathaniel. 2004. Problem Diagnosis & Introduction to Project Dynamics. http://ocw.mit.edu/index.htm. [Online] 13 April 2004. [Cited: 28 December 2014.] http://ocw.mit.edu/courses/civil-and-environmental-engineering/1-040-project-management-spring-2004/lecture-notes/l16diagnsprjctrl.pdf. • PA Consulting Group. 2010. Afganistan Dynamic Planning. MSNBC media. [Online] 2010. [Cited: 28 December 2014.http://msnbcmedia.msn.com/i/MSNBC/Components/Photo/_new/Afghanistan_Dynamic_Planning.pdf..
• Richardson, George P. 1986. Problems with causal-loop diagrams. System thinking. [Online] 1986. [Cited: 29 December 2014.] http://www.systems-thinking.org/intst/d-3312.pdf. • Sterman, John. 2000. Business Dynamics: Systems Thinking and Modeling for a Complex World. místo neznámé : McGraw-Hill, 2000. 978-0072389159. • Transentis Consulting. 2014. Causal Loop Diagrams. Business prototyping blog. [Online] 2014. [Cited: 30 December 2014.] http://www.business-prototyping.com/step-by-step-tutorials/. • Zhou, Jenny. 2012. Learn to Read Causal Loop Diagrams. System and us. [Online] August 2012. [Citace: 14. January 2015.] http://systemsandus.com/2012/08/15/learn-to-read-clds/. This page was last edited on 25 January 2015, at 21:16.